A famous work by Russian realist painter Ilya Repin (1844-1930) on show in Moscow’s Tretyakov Gallery has been seriously damaged after a man hit it several times with a metal pole on May 25. The 37-year-old smashed the glass protecting "Ivan the Terrible and his son Ivan, November 16, 1581" and punctured holes in the canvas. He says he did it because he believes the painting is a false representation of history as it depicts Ivan the Terrible killing his son, which the man says is not true. According to the gallery, the canvas is damaged in three places and the frame broken. “Luckily, the most valuable parts of the picture – the subjects and hands of the tsar and his son – were not harmed," Tretyakov Gallery representatives told the media. The canvas has been sent to restorers. This is not the first time the artwork, which was pained in 1885, has been targeted. In 1913, an Old Believer icon painter called Abram Balashov cut the painting with a knife while it hung in the same gallery. Repin immediately went to the Tretyakov to repaint his work, but could not complete the restoration due to the color-blindness he suffered towards the end of his life. It was only possible to repair the artwork thanks to photographs taken before it was damaged. 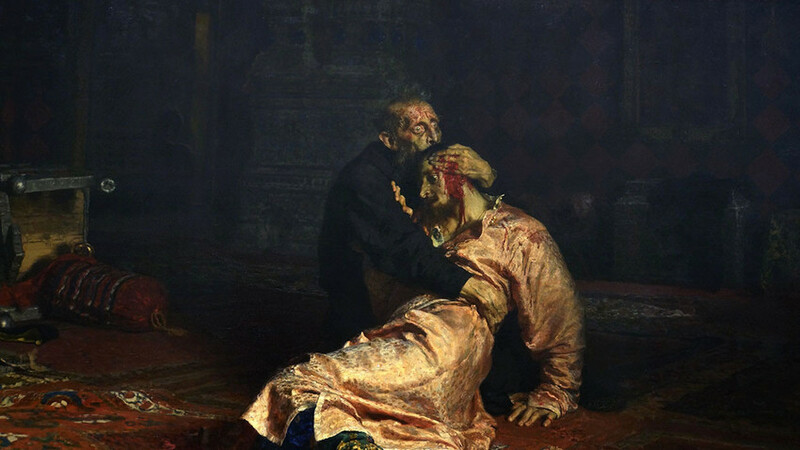 The painting shows Ivan the Terrible killing his son, Prince Ivan, in a fit of anger. Historians continue to debate the murder, as some say it never took place.